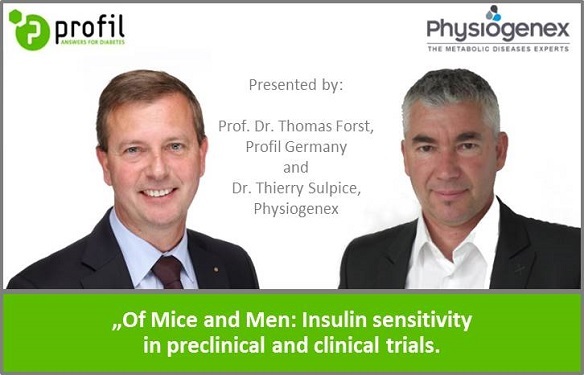 Webinar: "Insulin sensitivity in preclinical and clinical trials"
Free on-demand Webinar: "Of Mice and Men: Insulin sensitivity in preclinical and clinical trials"
Insights from experts in preclinical and clinical research. Watch now. This webinar discusses the methods applied in studying insulin sensitivity both in animal models as well as human trials. Benefit from the joint expertise of preclinical metabolic disease experts from Physiogenex and the clinical trial experts in metabolic diseases from Profil Germany. How to assess insulin sensitivity in the mouse model. The gold standard to study insulin sensitivity in human trials. How to move from efficacy studies in mice to trials in human subjects. And follow a discussion on predictability of mouse studies for human trials. Both companies will present the current view on studying insulin sensitivity in their respective models. The method of glucose clamping will be presented in its use in both mouse and human and advantages as well as possible shortcomings of this approach will be discussed. It will be exciting to compare both approaches and to discuss predictability of results from studies in mice for the design of subsequent human trials. If you are planning clinical or preclinical trials involving insulin sensitivity studies then this is definitely the right webinar for you to get an overview of the field and what to expect while planning and conducting your trials. While Physiogenex is recognized for glucose clamping in mice, Profil Germany is the global leader in automated glucose clamping in humans. This webinar, for its attendees, will certainly be one of the most interesting webinars hosted by Profil Germany thus far. Both companies are excited to use the results of the discussions from the webinar to further align and refine future collaborative activities. Prof Dr. Thomas Forst has more than 20 years experience in clinical research with special exper tise in the field of diabetes mellitus and its vascular complications. He lectures at the Johannes Gutenberg University in Mainz as a Professor for Internal Medicine/Endocrinology. As a member of the American, the European and the German Diabetes Association he serves as an editorial board member of several national and international journals. He has authored or co-authored more than 150 original articles in peer reviewed international journals. Dr. Thierry Sulpice has served as the Chief Scientific Officer of Physiogenex since September 2004. Prior to joining Physiogenex he was head of the in vivo pharmacology team working on new cardiometabolic targets at Sanofi-Aventis. 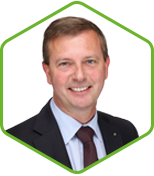 During his 9-year tenure at Sanofi-Aventis, Thierry was in charge of drug discovery optimization and preclinical development for projects targeting the cardiometabolic syndrome. He developed several in vivo technologies and new animal models which directly reproduced metabolic disorders and heart diseases. His expertise also covers the physiopathology and pharmacology of type 2 diabetes, dyslipidemia, vascular/heart diseases, liver and kidneys disorders. Thierry holds a PhD in Physiology and Pharmacology from the University of Grenoble, France. Since 1990 he has been actively engaged in basic research on cardiovascular physiopathology. In addition, Dr. Thierry Sulpice is the chairman/ CEO and founder of Bêtagenex, a Canadian preclinical CRO specializing in the role of pancreatic beta-cells in metabolic disorders. He is also the founder and Managing Director of Cardiomedex, a preclinical and clinical CRO dedicated to cardiovascular disorders, onco-cardiology and neurocardiology.